This lecture is devoted to talk about the Development of Face, Nose and Palate. 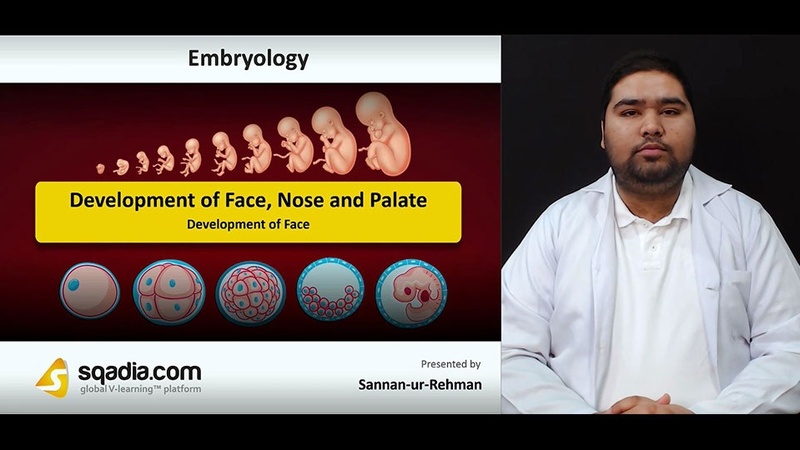 The objective of section one is the Development of Face. The educator started off by putting forth an Overview of various sources of development. Alongside this, the educator has shed light on the Development of Face followed by a description of various processes which make up the facial structures. These include, Frontonasal Process, Paired Maxillary and Mandibular Processes which make up the upper and lower jaws; respectively. In addition to this, Medial and Lateral Nasal Processes have also been brought into consideration. Moreover, Development of Various Parts of Face has also been elaborately elucidated. Subsequently, Embryological Basis of Innervation of Structures has been presented. In the end, the educator has wrapped up by a comprehensive debate on Development of Nasolacrimal Duct and Sac. The prime focus of section two is the discussion on the Development of Nose. In the beginning, the educator has thoroughly spoken about the Development of External Nose. Moving further, the Development of Nasal Cavities has been meticulously taken an account of. Next in line, Nasal Septum and Palatine Shelves have been reported. In the end, the curtains have been brought down when the educator talks about the Source of Development. Section three aims at describing about the Paranasal Sinuses and Intermaxillary Segment. Firstly, the educator converses about the Development of Paranasal Air Sinuses, in detail. This is succeeded by a discussion on the Lens Placode. Conclusively, the educator gives a scrupulous explanation of the Intermaxillary Segment of Face. The focal point of section four is on the Development of Palate. The educator commences by speaking about the Development of Palate. Along with this, the educator has also brought into consideration the Development of Primary Palate. Then the educator proceeds on to emphasize on the Development of Secondary Palate. Later on, the Development of Permanent Palate has been broadly delineated. In the end, Source of Development has been talked about. Section five accommodates Clinical Correlation. Firstly, the educator illustrates about the Cleft Lip. In addition to this, Types of Cleft Lip has been brought into dialogue. Furthermore, a few medical conditions have also been pondered upon, which encompasses; Oblique Facial Cleft, Microstomia and Macrostomia and Cleft Palate. Besides these, Complete Cleft Palate has also been expounded comprehensively. In the conclusion, the educator has summed up by stating about the Incomplete or Partial Cleft Palate.